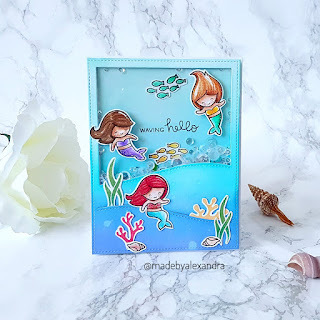 I started by stamping the images from Mermaid for you stamp set and coloured them using Polychromos . After I finished the coloring I added some details using a white gel pen . Next I die cut a panel using Stitched Hillside backdrop: portrait and started ink blending the background, and after that I created the shaker part of the card . 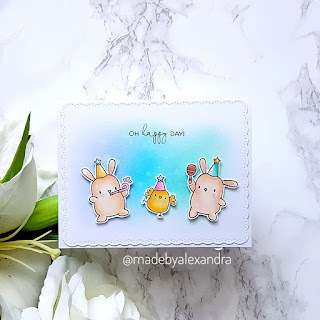 For this card I also have a video on YouTube and is part of a new serie I start on my channel so make sure to check it out if you want to see more cute cards coming . 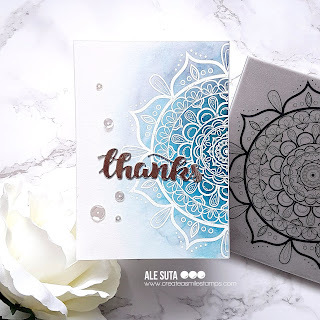 Here is the one I created using blue shades , I stamped the Mandala stamp on Mix media paper using Versa Mark ink and then emboss it using white embossing powder. To finished the cards I die cut the thanks word using Thanks twice die also from Create a smile stamps and some are die cut from silver cardstock and some from gold cardstock. Last step was to add some sequins and my cards were done ! Just wanted to let you know that I have now updated my blog to complete with the new General Data Protection Regulations . A big shout to Ruth who helped a lot and also I was inspired by Michelle and Tracy to create my privacy page. 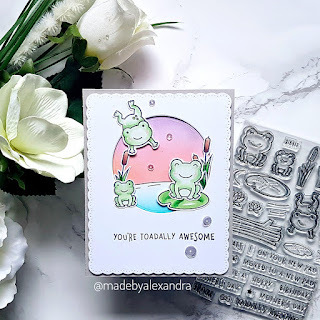 First I stamped and coloured the images from Toadally awesome stamp set using Spectrum Noir Alcohol Markers . Next I die cut the panel using Studio Katia Scalloped frames dies and then also took a circle die , place it in the middle slightly towards the upper part of the panel and cut it out . Then I stamped the pound from a stamp set from Craftin Desert Divas on the die cut circle and the masked the water to be able to ink the sky and I am using Worn Lipstick Distress ink and Cantaloupe Memento dew drop for the sky and Peacock Feathers distress ink for the water . The sentiment is from the same stamp set and I have adhered the images using foam tape and liquid glue . 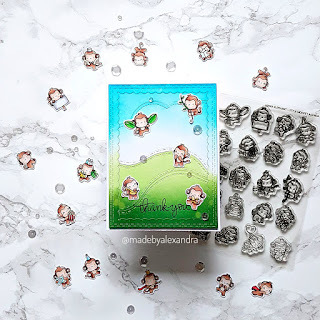 Made another card today using Mama Elephant stamps and this time I am using the Little monkey agenda stamp set and oh I cant even handle how adorable this monkey are . 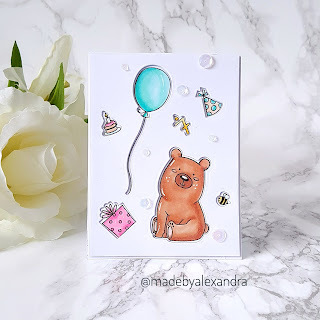 Today I am sharing another card that I made using Mama Elephant stamps and dies and this time I went ahead and create a floral card . 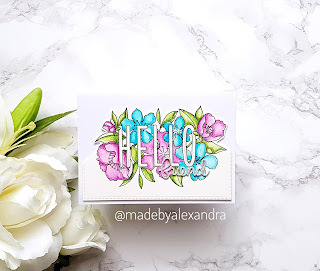 For this card I started by stamping the floral stamp from Mama Elephant Botanic Hello stamp set on Canson Mix Media paper using MFT hybrid ink. Next I started coloring the image using Faber Castell water color pencils and blending the color using Nuvo Aqua shimmer pen . Once the coloring was done I die cut several time the Hello friend script die also from Mama Elephant and adhered to the floral image. You can also check the video that I created for more details. 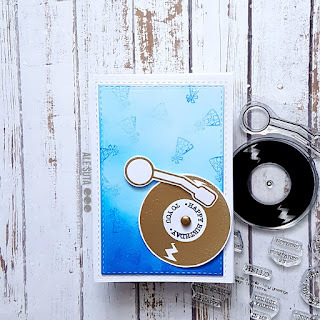 Today I am sharing a peek at the new release from Create a smile stamps . With this release Create a smile also designed 2 stencils that are fabulous . And Scattered hearts is so beautiful and I think that really cant be used all year round. There is also another sentiment stamp set which is in German and its called Ein ziemlicher knaller . Time for another card using stamps from Mama Elephant , and this time I combine some of their stamps to create a pop up card. I started by stamping the critters from Party animals stamp set and coloring them using Spectrum Noir Alcohol markers . After the critters were coloured I stamped the images from Birthday monkeys stamp set and also colour them using Spectrum Noir Markers. Once the critters were colored I started creating the background and for that I die cut a panel using Studio Katia Scalloped Frames dies and ink blend it using Cracked Pistachio , Peacock feathers and Shaded Lilac. I also created a video to share step by step how I created this card if you want to check.